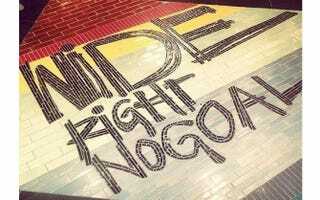 Lululemon's Buffalo Store Taunts Fans With "Wide Right/No Goal"
Being a Buffalo sports fan can be pretty depressing. The Bills are, at best, mediocre and remain the only franchise to lose four Super Bowls in a row while winning zero. The Sabres offer little relief, having also won zero championships and promising to be one of the worst teams in the NHL this season. Buffalonians don't need to be antagonized, so self-righteous yoga company Lululemon did exactly that and had the audacity to call it "empowerment." Here is what Lululemon put inside their new Buffalo store. Yup, they decided the best thing to do in their new city was remind fans of one of the most heartbreaking losses in Super Bowl history, also the closest their beloved Bills ever came to winning it all, and the Sabres' controversial triple-overtime loss in the Stanley Cup Finals on a goal that shouldn't have counted. Why don't they just make a video loop of those two moments and play them in perpetuity inside the store? Why not just punch folks in the face when they walk in? Buffalo fans were not amused. If you've followed Lululemon, this isn't a surprise. It's Whole Foods for yoga, telling customers the keys to happiness are buying $118 leggings, $58 tank tops, and a $48 towel and otherwise your soul is garbage. Chip Wilson, the company's founder, once addressed a fabric problem by saying the fault was in the bodies of the women wearing the leggings. His company has tried to patent tank tops. Those see-through pants that weren't supposed to be see-through? Yup, also Lululemon. And this being Lululemon, they really didn't see what the problem was, instead offering the world this blog post from a "local ambassador." The answer I give is the same when I work with kids and adults on empowerment. It is our efforts, our trials and tribulations, and our ability to dig deep, try again, and persevere that make us who we are. Success, sure that is great. But character, honest-to-goodness, gritty, get up and pull yourself up by your bootstraps character- man- that comes from days like "Wide Right. No Goal." ... So go to lululemon and stand on the "Wide Right. No Goal" entrance, dig deep in all the shared history, learning, and pride. Or stand on this rug, conveniently spotted over the phrase this morning.